I saw Right at Your Door upon its UK release in late 2006 and was impressed with the scope of the movie and the way it handled such an imposing subject matter. At the time the director Chris Gorak was still looking for a US distributor, which was proving somewhat difficult due to the subject matter and post 9/11 sensibilities. It was a full year before the movie finally got a limited theatrical release in North America. I recently saw the film again on UK network television and was further impressed with its exploration of a biological attack and the human cost. The movie has further relevance in light of current international events in the Middle East. Out of work musician Brad (Rory Cochrane) is at home when he learns of a series of explosions across Los Angeles, heralding a major terrorist attack. He attempts to drive down town to see if he can reach his wife Lexi (Mary McCormack) but is forced to turn back by the police. It is now apparent that the explosions are dirty bombs of some kind and that the ash from the burning buildings is potentially toxic. Brad returns home and seals himself in accordance with the authorities’ instructions. He is joined by Alvaro (Tony Perez), a maintenance man who was working at his neighbour’s house during the time of the attack. However matters are complicated when Lexi returns, apparently showing the symptoms of exposure to the toxins. Will Brad endanger himself by letting her in? Will she try to force entry into her home? Are the authorities trying to treat the public or are there more sinister motives to their strategy. Director Gorak drives this contemporary survival drama with a tremendously brisk pace, highlighting the confusion, indecision and fear that accompany such a scenario. He makes very good use of overlapping dialogue, with radio and TV background chatter frequently providing further details on the nature of the attack. The main performances are very good and the characters are flawed, conflicted and very credible. It would have been far too much of a cop out to paint them as selfless martyrs. The movie also shows the blind and illogical nature of human emotions with a series of frantic phone calls between the central characters and their families. It shows how humans wilfully refuse to accept facts in an attempt to maintain a sense of hope. The third act leads to a twist and possibly gimmicky ending but it does not undermine the overall narrative thrust of Right at Your Door. In the decade that have elapsed since the film's debut at the Sundance Festival, we have seen further evidence that the Government are not always well disposed towards their citizenry or doing the right thing. Consider the way Hurricane Katrina was handled and more recently the revelations about Project Prism. If anything the movies relevance has increased, irrespective of your personal politics. 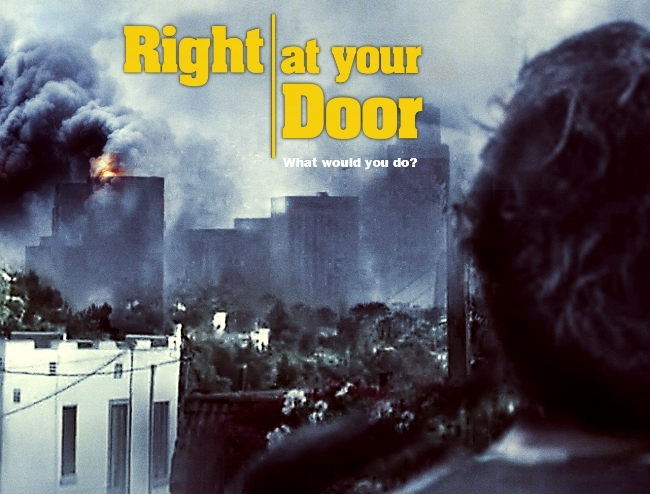 Overall Right at Your Door is a clever and concise directorial debut, which earned Chris Gorak a place on the Variety "directors to watch" list. Unfortunately this level of intensity and focus was conspicuously missing from his next film Darkest Hour.